Ok, so they said they’d like me to do an oral history of Pat O’Hare. Ok, fine. What’s an oral history? I’m new to this kind of stuff. Turns out I’m going to set up a video camera, turn it on and then sit down and ask Pat a zillion questions about his entire life’s history in surfing. Whoa! Pat is a Real Guy and has been in on things from the start and lived an amazingly rich and varied life, both in surfing and in general. This would make me the lucky guy. I get to pick his brains, ask questions about historical figures who loom large in the surfing world and enjoy being in his company. Pat lives right next door to me, so this is easy, insofar as access to my subject goes. And maybe we should stop right here so I can describe his place a little bit. 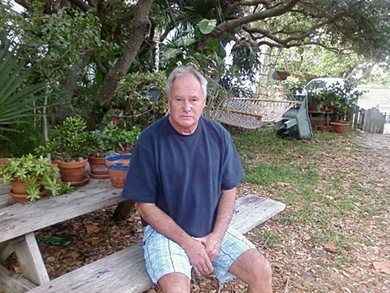 Pat fetched up in Cocoa Beach, right across from his beloved ocean in the southern residential part of town, many long years ago. Over the course of the following decades, he’s not let the grass grow under his feet, none of that “manicured lawn” motif to be seen anywhere. It gets mowed, and it’s not overgrown, but it’s clear that the mantra is more of a live-and-let-live nature. Plants grow where they may, fallen oak leaves dapple the sandy ground and the grass grows in a way that encourages bare feet to walk upon it. Just a small block home with a screened-in front porch shaded by native Florida oaks and palms, a weathered wooden fence brackets the back and side of things, and his son Sean lives in the house right next to it on A-1-A. Subdued pastel hues – Old Florida style, oceanic, weathered and faded to perfection by a loving sun – color the surfaces all around. Pat’s a pretty spiritual kind of guy, and the spirit infuses the whole area. The front yard abuts the back yard of Joel Silver, another spiritual kind of guy, but there’s no demarcation line, no here versus there, and the whole place – Pat’s, Sean’s, Joel’s and more – is wide open for little kids, neighbors, friends and family to amble or gambol as whim might dictate. Pat lives a quiet life and appears completely comfortable with himself and his circumstances. He lives the sort of life that most people only read about, and few people can truly understand. He has come so far beyond the standard definitions of success that it’s genuinely laughable to even speak of such things with him. Money and power mean nothing to him. He gets by, he lacks for nothing, he lives in paradise. He has dealt with the corrosive effects of power and he wants nothing to do with it. Although he says little, deep understanding glows from within his eyes. Those thoughtful eyes twinkle often, and laugh lines crease his face around them. I know this much about him before we start. So, ok. Let’s get this thing organized. Pad across the grass and knock on his door. We sit down and I tell him that the Museum would like an oral history, what I’d like to do and how we might go about doing it. He is just as accommodating as anyone could possibly be, comfortable and easy. And so things are arranged with Pat sitting at his small dining table, me across from him, and the video camera perched upon its tripod adjacent to me. The camera sits still, with no one else in the room to man it. It’s just Pat and me, and we both like it that way. Behind him, framed by the camera, is his kitchen. Everything is in as-is condition, nothing is dressed up, primped, prepared, or made to look in any way it does not usually look. But Pat has the heart and soul of an artist, and everywhere you look things are harmonious, complementary, interesting, well thought out and pleasing to the eye. We decide to do the interviews piecewise, giving it perhaps an hour or so for each session. In this way, Pat remains fresh and the stories bubble. We’ve been going at it now since January the first, and we’re still going at it. To this point, eight separate days of video interview have been captured, and there’s a few yet left to get. Pat is in charge, and the tells me when to go get the equipment and come set it up once again, by the dining table. We start off at the beginning and then ramble down the redounding decades, digressing here and there along the way for an especially good nugget, accumulating names, places, activities, good cheer and warm friends. Pat is originally from St. Louis but moved to California at an early age. He lived near the ocean in Manhattan Beach and was immediately absorbed by the surfing life in his area, centered at the Manhattan Beach Pier. He was born into the surfing universe in the 50s, started out riding inflatable rafts as many other kids did and then moved on to proper stand-up surfing just as balsa was being replaced by foam as the shapers’ material of choice. 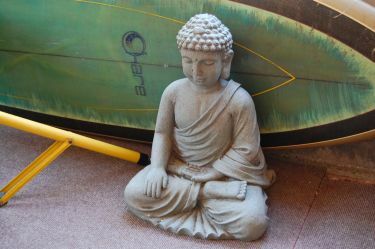 His first surfboard was made out of balsa wood, not because it was chic or retro or cool, but because that’s what they were making them out of at that time. That goes back a pretty good way, and Pat has been in the thick of it ever since. Surfing was just entering its modern era of explosive growth, and Southern California, where Pat was surfing, hosted world-class talent too numerous to mention. Weber, Noll, Edwards, Stang, Hynson, Dora, Jacobs, the list goes on and on. These are the guys Pat was surrounded by. Some he only knew of. Some he knew. And some he became good friends with. Pat was a natural athlete and soon became sufficiently skilled to hold his own in the lineup, and although Manhattan Beach Pier remained the center, he regularly took road trips up and down the coast. Malibu, Haggerty’s, San O and on and on. Imagine being a surfer in those days! It was all so free, all so open! Each new day beckoned, sparkling like a diamond. And each new jewel was taken wholeheartedly, joyously, unstintingly. As surfing worked its way deeper and deeper into his life, Pat naturally wished to find some way to support himself with it. Hanging out as a gremmie at the shops, washing the windows, cleaning up the mess, Pat and his friend Ricky James gradually worked their way deeper inside, tools in hand, as have innumerable others before and since. Pat began glassing. Shaping came next, first in his back yard, later in Greg Noll’s factory. After that, on his own, fully independent. Surfers, or at least the ones who give themselves over to surfing completely, always seem to pack enough adventure, love, triumph and tragedy into their lives to eclipse the lives of ten ordinary people and Pat was no exception. I sat spellbound as he recounted each new adventure. Story upon story tumbled into the air, shimmered for a bit and was then replaced by another. Rick James’s thumb. Dora driving off in Frenchy’s Volkswagen. Hynson and Weber weaving crossovers down an endless wall at Malibu. Just enough money in their pockets for the bus ride back to Tijuana. Tales recounted by other warriors, freshly back from the North Shore. Fistfights and dented fenders. The life! Oh, dear God, the life! Barbados. California. Florida. Mexico. Making it up as they went along. Life itself was a set of waves, and no one knew what was coming next, invisible, just over the horizon. But come it did, and he rode each new wave as best it could be ridden, be it brutal thrashing or a screaming rifle-shot wall ridden to safety in the channel by a gnat’s whisker. And whether each wave was made or not made did not matter. What mattered was that he paddled back out to meet the next one and give it his best. 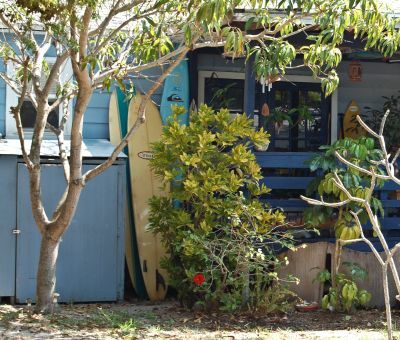 Eventually, things wound up centering themselves right here in Cocoa Beach, shaping surfboards for a living, settling down, raising a family, learning to become the very best person he could become. He became very good indeed and he reaped the reward of a good life lived, in the form of a good life lived. Another interview session concludes. The camera gear is broken down and placed once again inside of its bags. An airplane buzzes in the distance. A hopeful twitter sounds from an invisible bird somewhere in the greenery outside. Pat’s eyes twinkle and laughter creases his face, yet again. I wish I did not have to stop here, but at least I get to return and do it again, and really, is there anything more I can rightfully ask for? I will be a little bit reduced once these interviews are over. I will no longer be able to look forward to setting up the gear, chitchatting as I do so, and then sitting down and talking story with Pat O’Hare. It is very good stuff. And I thank my lucky stars that my life can now be said to include this additional small glowing light. 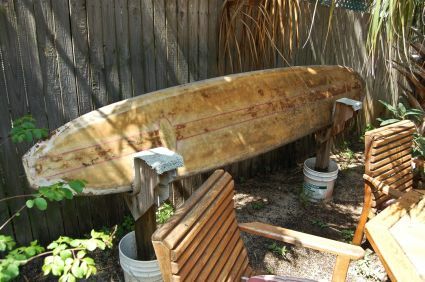 Great story thanks for sharing it with us, I remember having the pleasure to see Pat many years ago in the Cocoa area, I owned one of his boards back in the 70’s and it was a favorite. He will be missed by many for sure a true inspiration for us , R.I.P. Pat. Pat was my first real friend after moving here in 1963 from Manhattan Beach California at age 16 (we both went to the same High School). Pat was 22 and he taught me how to make boards. I worked in his shop for the next two years. He was just the same in the article as he was back then. Thank you Pat for all you did for us. We love you and miss you.